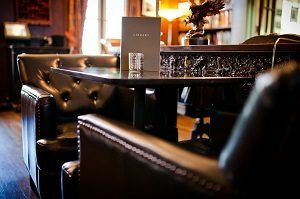 The original 1908 library of the Inn has been transformed into a lounge, themed around celebrated Mississippi authors. The library is adorned with a Civil War book collection; contemporary fiction and non-fiction works of famous writers like Eudora Welty, John Grisham, William Faulkner, Willie Morris and Tennessee Williams; and a taste of all things Mississippi– art, culture, music, etc. Available for Fairview Inn guests and open to the public, the intimate setting offers a popular gathering spot and unique venue to kick back and allow yourself to be engulfed by true, Southern hospitality. Enjoy the Library Lounge during your next stay at Fairview Inn! The Library Lounge serves lunch daily. The full lunch menu is available from 11 am – 2 pm; a limited lunch menu is offered from 2 – 4 pm. Fairview Inn in Jackson, MS provides a casual, friendly neighborhood lounge for guests to enjoy craft cocktails, micro-brewery draft & bottled beer, fine wines and wine flights, and creative small plates featuring Chef Corey Ellison’s regional cuisine.